Isiah Factor | The Insite » QUEEN MISTY – ANOTHER CELEBRITY ENCOUNTER! QUEEN MISTY – ANOTHER CELEBRITY ENCOUNTER! November 13, 2006 | Posted in Uncategorized | Comments Off on QUEEN MISTY – ANOTHER CELEBRITY ENCOUNTER! 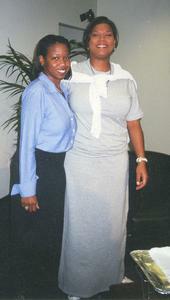 Houston Defender reporter Misty Starks submits this photo of her and Queen Latifah. Thanks for the submission. Make sure you send in your submission of your celebrity photo to isiahcarey@gmail.com!